**Nares (nostrils): **You waft through the nasal openings, barely inching between hairs meant to keep particles out. This begins the upper airway. Nose: It's not just an organ of smell, it also aids in phonation and easily lets air in. It's also the first line of defense against inhaled particles. Epithelial cells: You'll see these cells lining the air passages from the oropharynx to the respiratory bronchioles. Their main function is protection of underlying tissue and secretion. Note the wavelike movement of hair-like structures on the surfaces. Goblet cells: These are specialized epithelial cells that are randomly scattered along the way. Their job is to secrete mucin, which dissolves in water to form mucus. Mucus: This is formed by goblet cells and traps particles in inspired air to prevent them from getting to the lungs. It then rides up on those fine hair-like structures to the mouth. Once in the mouth it's called sputum. **Cilia: **These are those fine hair-like structures referred to above. They wave in rhythmic fashion and act as an escalator to move mucus to the mouth. Each ciliated cell has 200 cilia, and there are 1 to 2 billion cilia per square centimeter. Nasal septum: This is what divides the two nasal passages from the nare to the nasopharynx. Vestibule**: **This is the main cavity of the nose. Air is warmed to 98.6 ° Fahrenheit and humidified. Turbinates: These are three bone-like shelves that project into the nasal cavity from the lateral wall. They help with the sense of smell and warm and humidify inspired air. Pharynx: This is a funnel shaped passage where are travels from the nasal cavity to the larynx. It too aids in phonation. Both food and air travel this way. Nasal pharynx: This is the upper portion of the pharynx. Oropharynx: This is the middle portion of the pharynx, and from here you travel to the larynx. Look down! 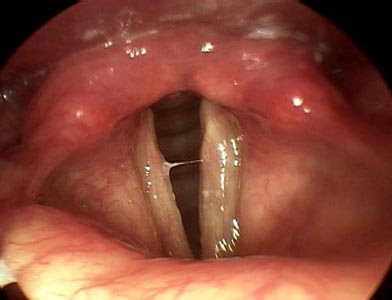 That dark opening is called the glottis, and those white objects on either side are the vocal cords. Vocal cords: These are only open when you inhale. This is another means to keep particles out of the lungs. As air brushes past them when you breathe out they vibrate, creating sound. glottis. When you swallow it lies down to keep food out of the lungs. Glottis: Only air is allowed to pass (yet a few particles sneak by). This is the opening to the Larynx. **Larynx: **This is a very short passage that protects the lungs during swallowing, helps produce a voice, and is often referred to as the voice box. Laryngeal skeleton: The larynx is kept open by nine cartilages, the largest of which is the thyroid cartilage, better known as the pomas adamus, or Adams Apple. Just inferior to the Thyroid cartilage you'll see the cricoid cartilage in the neck. **Trachea: **This is the main tube-like passage to the lungs, and is often referred to as the windpipe. It's kept open by 16-20 c-shaped cartilages. Carina: This is a fork in the road. Go right to the right lung, and left to the left lung. The respiratory tract from this point is called the lower airway. 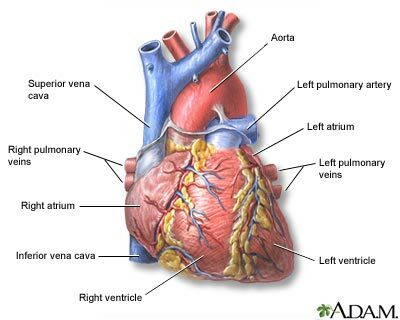 Lungs: The lungs are normally kept sterile by many of the mechanisms we described on our journey. Occasionally particles make it this far and cause havoc. Yet healthy lungs move particles out within 24 hours. Most particles are filtered by the upper airway. Porous and spongy organ, the lungs provide a space whereby large amounts of air and blood can come in contact for rapid exchange of gases to occur. 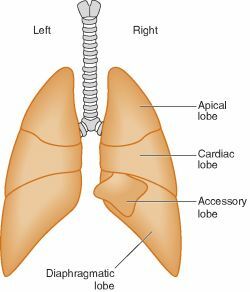 **Right lung: **It's actually larger than the left and has three lobes. Bronchus (large airways): This is the passage air takes as it begins its travel through the lungs. Air passes through the lobar region, segmental, then subsegmental. These airways divide into smaller and smaller but more numerous airways. Bronchioles (small airways): These airways continue to get smaller and divide exponentially. Air travels through the terminal then respiratory airways. There's no cartilage to keep the airways open here, which isn't good during an asthma attack (see picture). The bronchus, bronchioles and alveoli make up the bronchial tree. Bronchial Smooth Muscle: Crisscrossing and spiralling the outside the bronchial airways are smooth muscle fibers. During asthma these spasm and contract, narrowing these hallways, making it hard to breathe. Beta 2 Adrenergic Receptors: On the bronchial walls are tiny receptors. When you inhale beta-adrenergic medicine like Ventolin or Xopenex, the medicine binds to these receptors, and the reaction causes bronchial muscles to relax, opening the airway, and making breathing easier. Alveolar Duct: The respiratory bronchioles leads air to these fine ducts that terminate in clusters of 10-16 fine balloon-like structures called alveoli. Alveoli: Most adults have over 300 million of these in their lungs, and this is where most gas exchange occurs. Oxygen molecules inhaled wait here for an available hemoglobin molecule. Red Blood Cells (RBC): These look like little red boats or donuts. In the middle is a protein called hemoglobin. RBCs ride single file down the capillary beds in the lungs where they come into contact with the alveoli. Capillary: These tiny vessels transports RBCs that have carbon dioxide (a cellular waste product) attached to the hemoglobin instead of oxygen. These RBCs are purplish-blue in color. As you watch, you can see that once one of these RBCs comes into contact with the alveoli, the carbon dioxide molecule hops off the hemoglobin and an oxygen molecule hops on. The RBC then turns red. Oxygen now takes a ride to a tissue somewhere in the body. You suddenly feel a draft, and are sucked back up the respiratory tract and (A-chooooo) out the mouth and into the air. Its' cooler out here, and smells better too. You are now free to return to your normal size. Thanks for traveling with us. John Bottrell is a registered Respiratory Therapist. He wrote for HealthCentral as a health professional for Asthma and Chronic Obstructive Pulmonary Disease (COPD).